Togo Football Federation vice-president Herve Piza Alakiesto has received a four-match ban for an "attempt of aggression" at the Africa Cup of Nations. 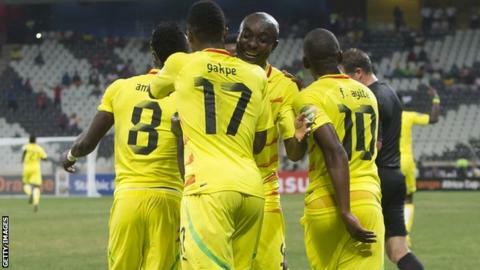 The Confederation of African Football (Caf) also fined Alakiesto $5,000 for the incident during Togo's final Group D tie with Tunisia on 30 January. Caf said the incident involved Mr Alakiesto and security forces in an officials' lounge in Nelspruit. The game ended 1-1 - a result which saw Togo through to the quarter-finals. Tunisia's Khaled Mouelhi missed a penalty which, if converted, could have sent them through at the Sparrow Hawks' expense. Togo's run at the Nations Cup ended in the quarter-finals, after they were beaten 1-0 in extra-time by Sunday's finalists Burkina Faso. The Togolese federation refused to comment when contacted by the BBC, but acknowledged that they had been notified about the sanction.